Economical and effective solution for security theft problems. No wiring is required, cheap and effective way to install, using the included screws to the ceiling or wall, 2 pcs AA batteries operated (not included). 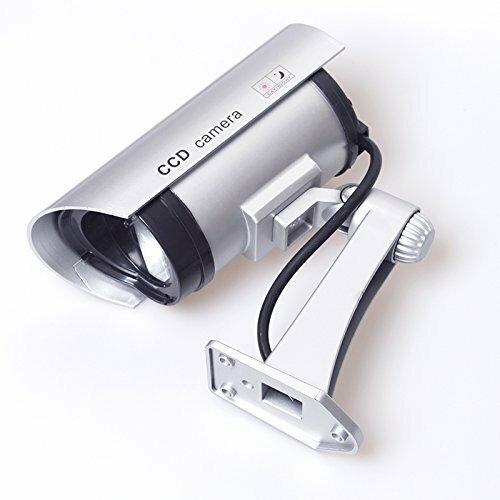 Material: High quality ABS, compact design, easily install, appear to work as actual security camera. No wiring required, suitable for front door, garage, back gate to deter thieves and criminals. 30 Fake Infra Red Night Vision LEDs that stay illuminated during darkness, each camera includes the security sticker shown. Bracket Arm Movement: Fully adjustable(0-90 downward tilt,0-360 L/R rotation). Package: 3 x Cameras + 3 x Screws. (2 pcs AA batteries operated, not included). View More In Simulated Cameras. If you have any questions about this product by Emovendo, contact us by completing and submitting the form below. If you are looking for a specif part number, please include it with your message. Yanwein Indoor or outdoor motion activated dummy camera with flashing red LED light.